As a wedding musician, I get to see a lot of fantastic venues. 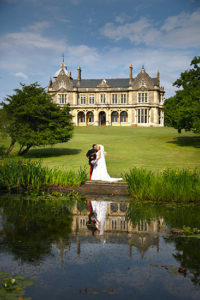 Based in Bristol, I’m lucky that there is a big, varied choice of amazing places to get married nearby. 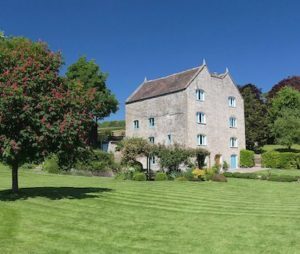 There’s hidden gems right here in the city, and in the neighbouring counties of Somerset, Gloucestershire and Wiltshire you’ll find everything from country manor estates to tithe barns, boutique hotels to castles. Heading West towards Wales and South to Dorset, Cornwall and Devon you’ll find stunning beachside venues, farms… I’ve even played at a lighthouse once! It’s hard to have favourites when there’s so many brilliant venues around, but here’s a few of my top picks. I must say, it was very hard to narrow it down to just 10 and there are lots more I’d love to include. 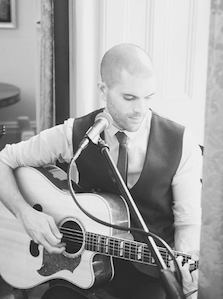 For a list of ALL the venues I’ve played at in my time as a singer/guitarist for weddings, see my full list of venues here. Without any further ado then, here’s 10 of the best! I’m lucky enough to visit Aldwick quite often – it’s a popular spot to get married and for good reason! It’s in a fantastic location, just half an hour South of Bristol near the beautiful Mendip hills. 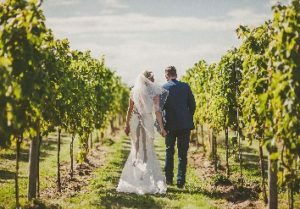 A perfect blend of countryside chic with a modern twist, it’s a working vineyard so you’ll have the opportunity to test their British wines, and if you get married here there’s some fantastic photo opportunities in the grounds! There are two adjacent barns, one which holds the wedding ceremony and the larger barn which is set up for the wedding breakfast during the daytime. Later on, there’s plenty of space to hold a wedding band or DJ to keep the party going until late. There’s a large outdoor space which is absolutely perfect in the Summer if the sun is shining. I have many fond memories of playing live acoustic music out on the terrace as guests mingle and the married couple have photos taken. Apart from the stunning surroundings, I think my favourite thing about Aldwick is the people – you’re always greeted with a friendly welcome and the staff and catering team are so helpful! 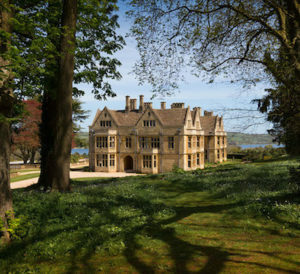 Just down the road from Aldwick is the bold, imposing building that is Coombe Lodge. Similarly to Aldwick it’s in an amazing location, just outside the village of Blagdon, adjacent to the Mendip hills. With stunning views of Blagdon Lake, out to the Chew Valley countryside, it really is an amazing spot and on a clear Summer’s day the views are hard to beat. It’s a country house building with exclusive use of the house and gardens for weddings so you can truly make the place your own. I’ve never been to a wedding at Coombe Lodge that hasn’t been full of fun! I think the staff are a big part of what makes this place special – they always go out of their way to make sure everything runs perfectly and are always friendly and helpful. It’s always a pleasure to play guitar at Coombe Lodge, whether I’m out in the gardens in the Summer sun, or inside in the cosy surroundings in the Winter – it’s one of my favourite places to visit. 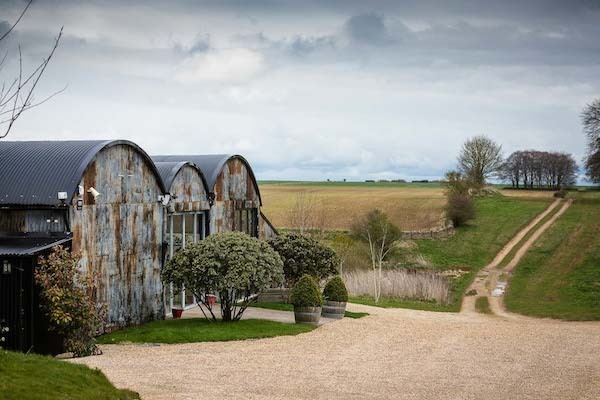 Set in the middle of the beautiful Cotswolds countryside, this barn venue is absolutely gorgeous – pay it a visit and you’ll fall in love with it instantly! They’ve won many awards at Kingscote and it’s easy to see why. Apart from the incredible views and the fantastic buildings, the team at Kingscote are just brilliant and always on hand to make sure everything runs smoothly. 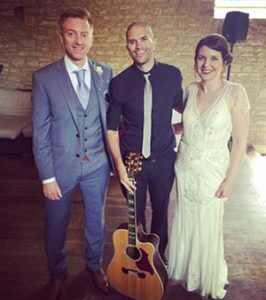 I’ve played guitar in various locations at Kingscote Barn – in the main barn for the wedding ceremony, near the bar and in the reception room as guests have drinks and canapés. There’s also an outdoor area, and in the Summer you can get married outside with views of the glorious countryside as you walk down the aisle. I can play acoustic music outside if the weather allows, and the gardens out the back are quite a sun trap when the sun is shining. Drinks, relaxing in the sun and live acoustic music – perfection! On the North-Western Devon coast, Tunnels Beaches is surely one of the most amazing places in the UK to get married. The location is simply jaw-dropping – you even get your own private beach if you’re married here! 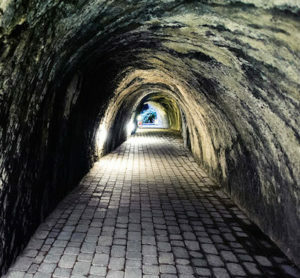 After walking down the famous tunnels which were hand carved in the 1820’s, you enter the venue, nestled neatly into the rocky coastline. The vibe is stylish and relaxed – seaside chic with a modern twist. The open plan layout of the venue means that you always feel like you’re outside, even if you’re not – and you have that relaxing sea view at all times. 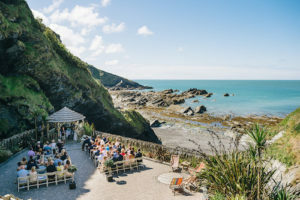 It’s a spectacular place to get married, and I always have a tingle of excitement when someone books me to play their wedding music at Tunnels! I’ve played here during the daytime, in the evening, inside and outside and each time it’s been an fantastic occasion. A word of warning if you’re interested in getting married here though, it’s highly in demand as you could imagine, so you may have to book well in advance to secure this amazing place as your wedding venue! Wick Farm Bath is actually a venue I’ve not visited that often, but I wanted to include it on the list because a/ it’s stunning and b/ I got married here! 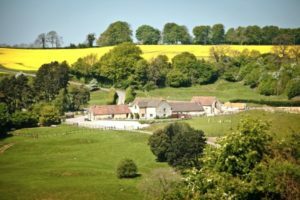 I also think it’s a little under the radar – although it’s certainly very popular as a wedding venue, it seems that not that many people I speak to have heard of it. So a worthy mention for this lovely barn venue. The owners are relaxed, friendly and are happy for you to really make the place your own. They were tremendously helpful when we were planning our wedding, and equally as welcoming when I came back to sing at a wedding a few months later! The inside of the barn is cosy and warm with underfloor heating if the weather isn’t so great, so perfect for Winter weddings. In the Summer sun, guests can mingle outside in the beautiful grounds so it’s a winner in all seasons. 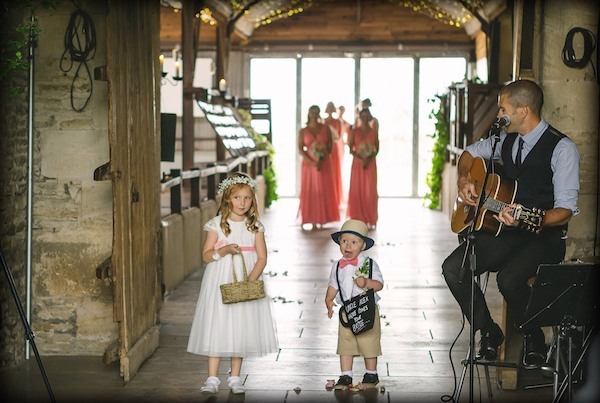 I love playing guitar here – the acoustics in the main barn are beautiful for wedding ceremony music, and if the sun is shining you can’t beat a bit of acoustic music out on the terrace! Priston Mill, not far from Bath, comprises two separate buildings – the Watermill and the Tythe Barn. Both equally stunning in their own right, the Watermill is totally unique and the Tythe Barn is warm and inviting. You can host your wedding in either of the venues – the Tythe Barn has a bigger capacity but the Watermill may be on your list if you’re looking for somewhere a little more quirky. Both venues are perfect for music, especially if the weather is good. 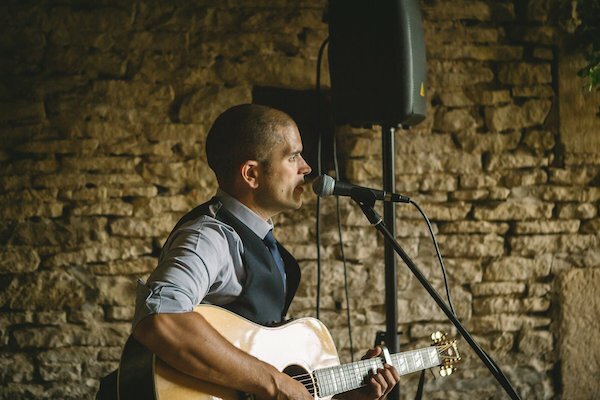 Guests can wonder the gardens and enjoy the beautiful North East Somerset countryside… whilst listening to some live acoustic music in the sun! If you have your heart set on a stunning manor house with beautiful grounds and plenty of amazing photo opportunities, Clevedon Hall may be just the place for you. Located in the sleepy seaside town of Clevedon, the beach is just a stone’s throw away – so as well as getting amazing photographs in the extensive grounds (you may even see some deer if you’re lucky! ), you could also pop over the road and get some pictures by the sea, or by Clevedon’s famous pier. Acoustic music works fantastically at Clevedon Hall – the grand main hall plays host to the wedding ceremony, where I’m often booked to play during the bridal entrance, the signing of the register and as the married couple make their jubilant exit. Afterwards it’s outside for drinks in the sun, weather permitting, where I’ll play some music as people mingle and enjoy their afternoon. Later on, the place is transformed for the evening party and it tends to get pretty lively! I’m often booked to do a kind of ‘warm up’ set before a DJ or live band take over for the rest of the evening. There’s a lot of wedding venues in the Cotswolds, but this stands out as one of my favourites. 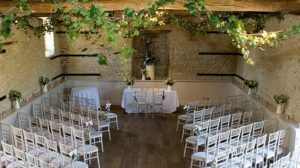 Just outside the picturesque town of Tetbury, it’s main feature is the beautifully restored 16th century barn, and it also has accommodation on site with self-catering cottages which can be used by the wedding party. Equally beautiful inside and out, it doesn’t matter if it’s raining at the Great Tythe Barn – the grounds are lovely in the sunshine but it’s just as good inside if the British weather isn’t playing ball! Again, at this venue I tend to be booked for the wedding ceremony and drinks reception but I’ve also done a few evening events here which are always good fun! Now, this venue I think falls into the ‘hidden gem’ category! Not far from Tavistock in the Dartmoor countryside, this venue is truly one of my favourite places to visit. The word ‘magical’ sounds a bit cheesy, but there really is something other-worldly about this place. From the moment you drive through the large wooden gate, you realise this is no ordinary wedding venue. It sits next to a small river, and as you walk around you notice unique personal touches everywhere – the attention to detail makes this spot really stand out from the crowd. As well as having a beautiful location for the wedding ceremony, there’s also a grand luxury marquee which hosts the wedding breakfast and evening celebrations. Some of my favourite memories are of singing in the sunshine as guests mingle and explore this unique place. However, I think the thing that really makes Ever After tick is owner Nicola and her team. 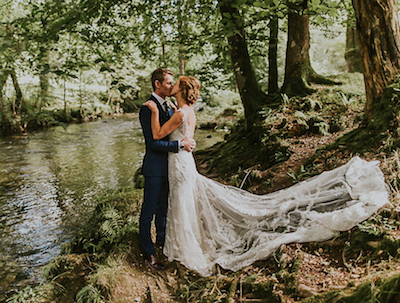 Nicola works with you to ensure you get your perfect big day – she’s incredibly knowledgeable, helpful and will even style the wedding to make your vision a reality. It’s a truly personal service, and every time I have the privilege of playing a wedding at Ever After, it’s clear how much time and effort has been spent preparing for the big day. Just a really special place, with wonderful people. Last on my list but most certainly not least, it’s another barn venue (you’re probably realising that I really love converted barns by now!) – and one of the most spectacular ones you’ll find. In the heart of the Cotswolds, you drive down a country track to get there and at first you may wonder where you’re headed! As you drive on, the barn emerges in front of you, almost hidden in a little dip amongst the fields that surround it. The first thing that strikes you is the corrugated iron roofs over the Dutch Barns, which gives it a rustic, traditional feel. When you walk in, it really takes your breath away. It’s a big space which can accommodate up to 250 guests if required, and is tastefully decorated with draped lighting and a stunning open plan layout. The other thing you’ll notice is the smell of food being freshly prepared in the open plan kitchen, as the chefs flame grill delicious offerings right in front of your eyes. My mouth is watering just thinking about it! 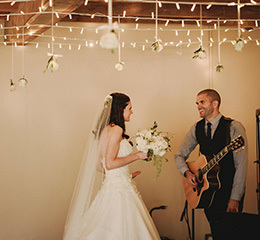 The ceremony room is equally as stunning with it’s stone walls, high ceilings and traditional styling. Outdoors you’ll find a relaxed area where guests can enjoy drinks and canapés, and later on the fire pits are lit to create a warm, cosy atmosphere. It’s an absolutely amazing place to play live acoustic music and I just love visiting this gem in the Cotswolds. So there you have it. 10 of the best wedding venues in the Southwest – but there’s plenty more to choose from! If you want to see a full list of venues that I’ve played at, arranged by area, click the link below. Wedding Venues Southwest – the Big List! I hope this blog was informative – if you’re planning your wedding and found this article useful, let me know! 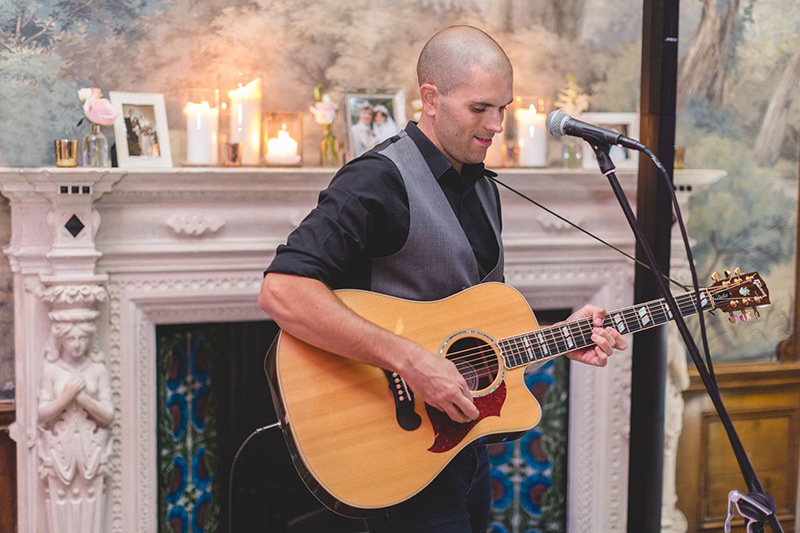 Or if you have some feedback about wedding venues I’d love to hear from you… drop me a line at info@guitaristforweddings.co.uk or via the Contact Page. This entry was posted in News, Wedding Guitarist Blog and tagged acoustic, Bath, bridal, bride, brides, Bristol, ceremony, Cotswolds, Devon, guitar, guitarist, idea, ideas, inspiration, inspo, live, live music, music, musician, planning, singer, song, songs, southwest, styling, venue, venues, wedding, weddings by Pat McIntyre. Bookmark the permalink.